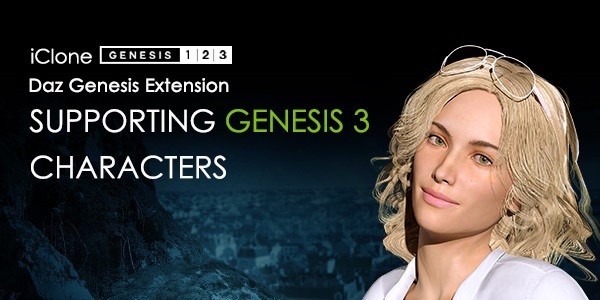 iClone Daz Genesis Extension is supporting Genesis 3! iClone is a proven pipeline that Daz users have been using for a long time to produce awesome, quality work with all the beautiful content that Daz has to offer. Now Daz users are able to import their Genesis 3 characters to iClone! That means a massive library of Daz Genesis 3 characters can now be easily brought into iClone and animated using iClone's powerful animation tools. The updated DUF file that comes with the Daz Extension imports in all the facial blend shapes for full and detailed facial expressions and automatic lip-sync. Will this great functionality come with iClone 7? Yes, iClone 7 includes all functionality of iClone 6 Pro, and then whatever will be added. See this page: https://www.reallusion.com/event/iClone7-preorder/. Scroll to the bottom for a comparison chart, where it also notes what I stated above. This largely works well, but I noticed a bit of wonkiness with the hand-rigging with the Genesis 3 to iClone export. I was going to use a Genesis 3 morph I created for my Rocky IV fight recreation, but the fingers did not bend correctly (as if the fingers were out of alignment or the weight mapping didn't fully cover them). I'm not sure if my morph was too extreme for the conversion, but I opted for a Character Creator morph instead (which was probably for the best).